Mirror Stage II.—‘space fear’, & the ‘ideal’. (part (ii). ): Nietzsche on the intellect, language, the ‘I’ as fiction, and ‘intuition’. Mirror Stage II.—‘space fear’, & the ‘ideal’. (part (iii). ): the Undivided Continuity of States. —‘analysis’, ‘duration’ & ‘intuition’ in Bergson. Mirror Stage II.—‘space fear’, & the ‘ideal’. (part (iv). ): language, ‘intuition’ & flux in Nietzsche & Bergson, & the fiction of the ‘I’ in Lacan. *the ‘frozen’,… —as opposition to the turbulence of movement. […] *freezes it and in a symmetry that reverses it, in opposition to the *|turbulent movements| with which the subject feels he *animates it. *(Lacan, ‘The Mirror Stage’, 76). *… —The mirror stage represents an attempt to wrest (the fiction of a) fixity-stasis (—peace and security) from the chaos of an underlying flux of movements of and within the subject (—psychological and bodily), and in(-within) its environment (surrounds-environs). *It’s possible, then, to read (—to give an account-a reading, here, of) the origins of the ‘mirror stage’. *—The material from ‘Ethics’… places my own spin on ‘space fear’,… reading it (implicitly-by implication) with, or in terms of Nietzsche, Bergson, and Hulme on language and flux, and Nietzsche’s later doctrine of the ‘will to power’ *(—for my reading of the ‘will to power’, see elsewhere on this blog). The fear I mean here is mental, however, not physical […] *a kind of “space-shyness” in the face of the varied confusion and arbitrariness of existence. In art this state of mind results in *a desire to create a certain *|abstract geometrical shape|, which, being durable and permanent shall be a refuge from the *flux and impermanence of *outside nature. In the reproduction of natural objects there is an attempt to *purify them of their characteristically living qualities in order to make them necessary and immovable. *The changing is translated into something fixed and necessary. *—This… ‘space-fear’ gives birth to a desire to imbue the flux of external phenomena with a static form, or ‘shape’. However,… *—in ‘geometric’ art this reproduction aims to ‘purify’ phenomena, sloughing off all that is contingent in them, and drawing out all that is ‘necessary’, imbuing them with permanence and redeeming experience from its contingency. *—In a passage which I love… —I think it’s stunningly astute, and uncannily accurate, on the psychology of the motivation to write—to attempt to create art… —Worringer identifies ‘an immense spiritual dread of space’ at *‘the root of artistic creation’ in what he calls ‘the urge to abstraction’. —It’s not until the later piece that he fully incorporates Worringer’s conception of ‘space-fear’ into his own definition of the ‘classical’ and modern art. *… —to retrieve (redeem)—to save—experience, then,… —from the sense of its being inessential and lost.—without meaning or (necessary) consequence. —to redeem experience from the overwhelming mass—the flux—of forces (—events, possibilities, obligations-demands, desires, anxieties…), uncontrollable and vast. —that, at ‘the root of artistic creation’, lies ‘an immense spiritual dread of space’. … —the fear of the (apparent) vastness of space (paradoxical as it might nonetheless seem) is in fact revealed as a fear-resentment of (life’s)smallness. —fear.—of an incapacity to control.—a resentment of the smallness of the lived. (frustration the incapacity to exceed the limits of circumstance circumscribed, and realise the potential-desired, felt). to be caught (inescapably) in-within the smallness of what must be lived (circumstance) at the cost of the all-else that could (—that ought?) to be lived. —to fix the lived (—the impression) in a fixed form. in a form which makes (which renders) it necessary. —to record the impression—atomically (—faithfully).—find (to use) the precise—exact—words. to fix the core of the experience and render it sharp, hard and precise (‘geometric’).—to give it a shape. (existence—having existed-lived—become necessary to the creation of the form and become necessary through its own embodiment within—imbued with—the form). to redeem (to show—to reveal—the already redemption of) the lived, in-by recognition.—of the work (—the image).—of the attempt to articulate the intuition. a need.—to have the sense of an intuition recognised. something worthy of being communicated (—set down). recognition of the need (the compulsion) to set it down. to create a solid, stable object that demonstrates the necessity of experience. makes experience-the lived necessary to itself,—to its own creation. a yearning (—an ache) to realise and to communicate and to have that feeling-sense be recognised (and be shared-requited). to be recognised as self in another-others and reflected. to be known (and to be loved). —of the structure (—the shape) of the impression-impressions. … —of the forces.—physical: movements, pressures.—of the senses: light, colour, touch, smell, sound… —of the emotional.—of connections in-of memorial-remembered (memories—conjured up, so to). —of the competing impulses of which the impression is comprised-composed.—their arrangement, their relation to one another and their (relative) prominence. and all compete (struggle) for balance, for clarity, for order,—for dominance. and the balance-order, at any one given moment, is what decides what I am (to be). —the result (the end) of a process of struggle (negotiation) of—between—drives and forces. —the name (retrospective)-naming, thus, of the arrangement—the hierarchy—of forces. —a multiplicity of forces (of sub-wills). a projection.—a fiction of unity projected onto the flux of forces. —the origin and the history of a ‘thing’ (of any given thing): first, a projection—projecting back a name—onto an arrangement-heirarchy of forces. and second—a forgetting of (that act of) projection (that act of creation). the name—the forged thing—taken to be (the) real. (because—for Nietzsche, following Kant… —all that we can have access to and thus have knowledge of are the objects of everyday experience. because we cannot think outside the limits of our senses, we take those objects of experience to be real—in-themselves. … ). —as the result of a continuing process of naming (—names). —a continual (continued,—continuing) process of being (having been) interpreted. —from the retrospective imposition of a unity (—of unities) upon the flux that flows always (anyway) beneath. upon the flux of forces. —appropriated by (—linguistic) forces. overpowered. —the history, then, of any (given) ‘thing’, then, is a chain of signs (of names, of naming…). —a history, then, of *interpretations…. not (no, never) a progress-thus progressive. only ever a series (—a succession) of—mutually independent—processes. —exacted on the (given) quantum of reality. (—of resistances, then, and of overpowerings). as in the process of the formation of language. first: the stimulus of sense-sense-stimulus. transposed-translated into a word (—a sound).—from a need (felt) to discharge the (physical-physiological,—psychological) reaction to the stimulus. (the word as a metaphor—as first metaphor—for the stimulus felt). when many such similar impressions are yoked together (—grouped), under the aegis of a single word, that word becomes a concept. —a name for a group—a cluster—of experiences (impressions), which serves to yoke them all together according to the similarities that they share. (and must overlook—must elide—all the differences between them. (at two removes, then, from the sense-stimulus which gives birth-rise to it). —formed by discarding the differences between all (of those) individual leaves. *—breaks down—fragments—its subject (—the flux) into parts-thus elements (—‘things’).—all made to participate with other fragmented elements in-under—pre-existing—concepts. —in the forgetting of that (act of) art (—creation)—the (mistaken) taking of the fragment-‘thing’ as-for a thing-in-itself (—as-for the real. …). (—a name.—an ideal thus.—impossible to hold to,—impossible to attain identity with.—thrust upon on, thus, from without,—in linguistic…). beneath the veneer, then, of (supposéd) ‘things’ (—of what we come to think of, then, as ‘experience’).—beneath the membrane (the skein) of artificial fragmented atoms—of ‘things’ in-of conceptual space, and of ‘moments’ in conceptual time—there subsists a foundation (—a substrate) of undifferentiated ‘states’. —the flux of an undivided continuity of ‘states’. —forming, then, (just) one reality, nonetheless, however paradoxical it may seem, comprised of this continual flux of successive ‘states’. after a time, through habitual use (—familiarity)—convention—the concept (concepts) become empty—flat and stale—and elide (ignore) the details and the variations (—the engine of the difference) between things. —no longer maintain any connection to the sense-stimulus from which they originally evolved-arose (no use value any more.—no connection to the quanta they were born to name—to which they, in effect, gave birth). *Lacan,… and the ‘frozen’ (—‘freezes’) as opposition to ‘tubulent movements’ *(—the turbulent movements in-of the flux of the organism. … ). *The ‘mirror stage’, then, as—the appropriation, or the… pulling, of the non-/pre-egoistic subject (so to—sic?) 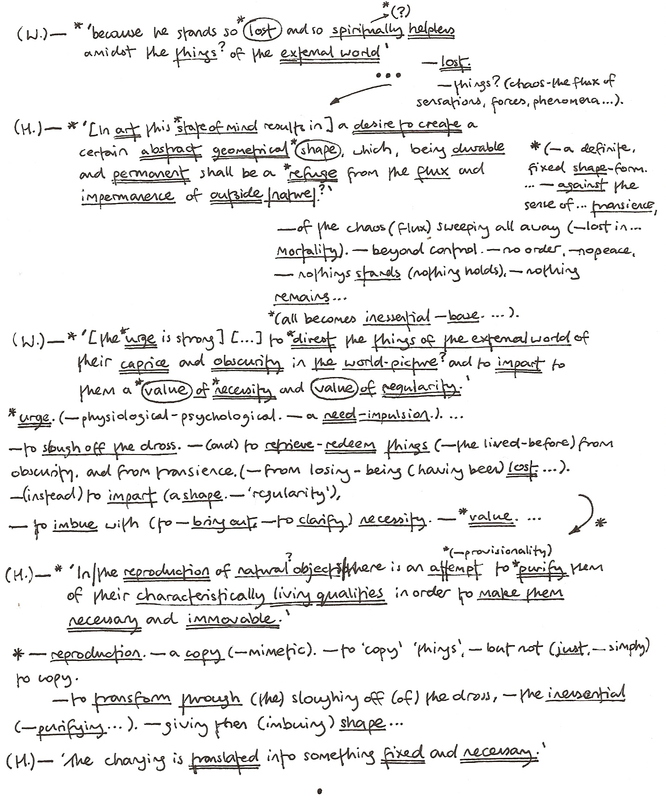 into extant (pre-existing) orders/structures (—the legislation, in early-Nietzschean terms) of language. *—(what I’ve dubbed here, for my own purposes) *—the flux of the undivided continuity of states.… —subsisting, then, beneath the individuated concepts of the intellect in Bergson’s conception of ‘duration’, and, I’d argue, in Nietzsche’s… analogous critique of the intellect and championing of ‘intuition’ in the early ‘On Truth’ essay. —The word becomes a concept when it no longer refers exclusive-solely to the sense-stimulus which gave birth-rise to it, but is used to… yoke together disparate phenomena. … *—the (attempted) elision of the differences between diverse experiences (stimuli) and the attempt to equate unequal phenomena (under a single head, so to). …—They become, in effect, stultified metaphysical prejudices——divorced… —alienated from experience. *For both Nietzcshe and Bergson… there’s a (however, perhaps, regrettable) necessity in-to the spatial-temporal fragmentation (—into atoms,… quanta) in, or rather through, the impositions of language. the *|total form| of his body, by which the subject anticipates the maturation of his power in a *|mirage|, is given to him only as a *gestalt, that is, in an *exteriority in which, to be sure, this form is more *constitutive than constituted, but in which, above all, it *|appears to| him as |the *contour of his stature| […] (76). In order to overcome and—importantly—to repress,… the chaos in-of an underlying flux *(in-within the organism (organs-drives-forces…)… —of an undivided continuity of ‘states’… —?). *—The ‘mirror stage’ then, represents an attempt to wrest (the fiction of a) fixity-stasis (—peace and security) from the chaos of an underlying flux of movements: of and within the subject (—psychological and bodily), and in(-within) its environment (surrounds-environs). —Is this flux pre-linguistic and (therefore) pre-egoistic for Lacan, as it is for Nietzsche and Bergson… —?